Here's our Inside NNIRR newsletter with an update for donors and members on activities this year. We want to thank all of you for your support -- in all of its forms -- as we address the daily barrage of racist and devastating attacks against immigrants and refugees. 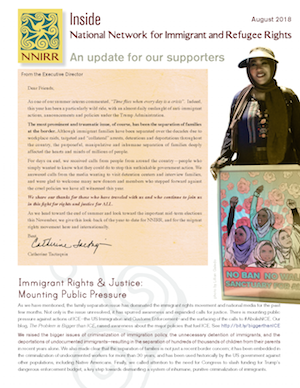 The newsletter highlights NNIRR's advocacy and education efforts, as well as developments in our emerging "Climate Justice & Migrant Rights" initiative. Included is our new fact sheet, Climate Change, Global Migration & Human Rights), and our very busy International Migrant Rights program. We also shine a spotlight on the amazing work of Eddie Canales (our board chair) and the South Texas Human Rights Center (STHRC), where Eddie is Director. STHRC has set up 100+ water stations in the border desert, is operating a Missing Migrant hotline and is working tirelessly to help families locate loved-ones last lost in the South Texas border region. NNIRR has reaffirmed our commitment as a center for human rights advocacy and education for immigrants and refugees, and we need your continued support! NNIRR relies on our grassroots members and donors and we are deeply appreciative for all you have done for us this year. Donate! Any amount makes a difference. If everyone we reach today gave $10 we would be able to add a program person to our small team! Order our Just Borders T-shirt or the fabulous NNIRR Cookbook: Recipes on The Move! Making the link between climate change and migration, two critical issues of our time that are deeply interconnected. Migrant rights and climate justice movements -- together -- can push for changes that meet our mutual goals for social and environmental justice in the U.S. and globally. We have a roster of the 100+ bills related to immigration that have been moving through various stages in the House and in the Senate. The tracker is periodically updated and lists bills by number and also by subject, with links to summaries and updates. Check out our Fall Sale!